Of the activities I consider “Christmas”, and thus not appropriate before Thanksgiving, are listening to Christmas music, making Christmas cookies, and watching Love Actually. Currently, I am watching Love Actually, and I regret none of it. It is hands-down the best holiday movie ever made. Ever. In fact, I plan on watching at least once a week between now and Christmas, so if you are reading this and love it as much as I do, let me know. We’ll set something up. 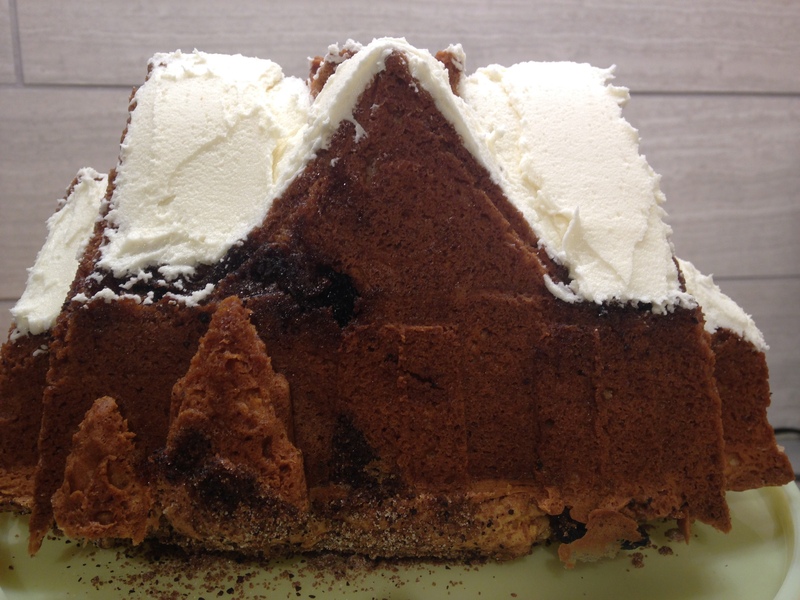 Anyways, because I caved and agreed to watch so early, it only seemed fitting that I should also break out my gingerbread house bundt pan to make dessert tonight. 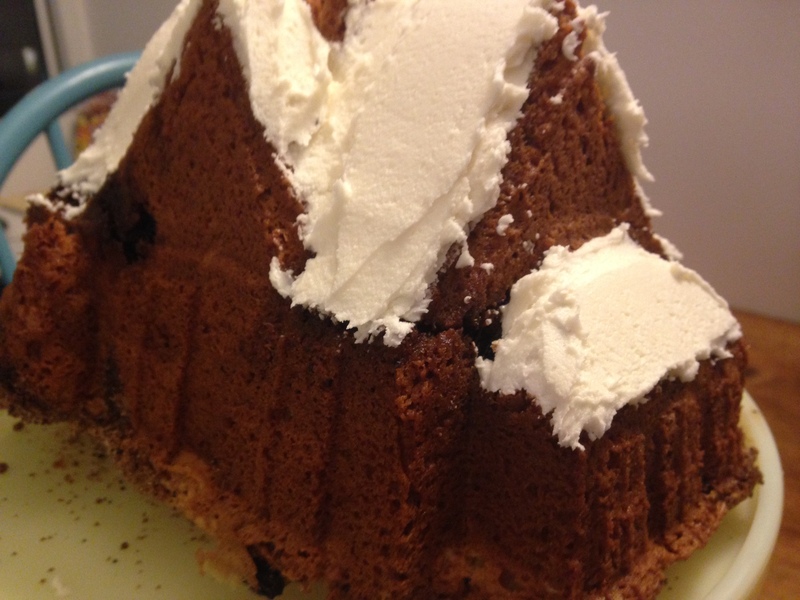 Besides, I’ve been dying to make this recipe for ages, may have attempted once before and failed, and only have the one bundt pan, which doesn’t necessarily lend itself to year-round baking. Happily, this time through was much more successful. Aided largely by the fact that I actually followed the recipe rather than trying to get creative. I should have known better than to mess with Claire’s recipe the first time – I’ve learned my lesson. 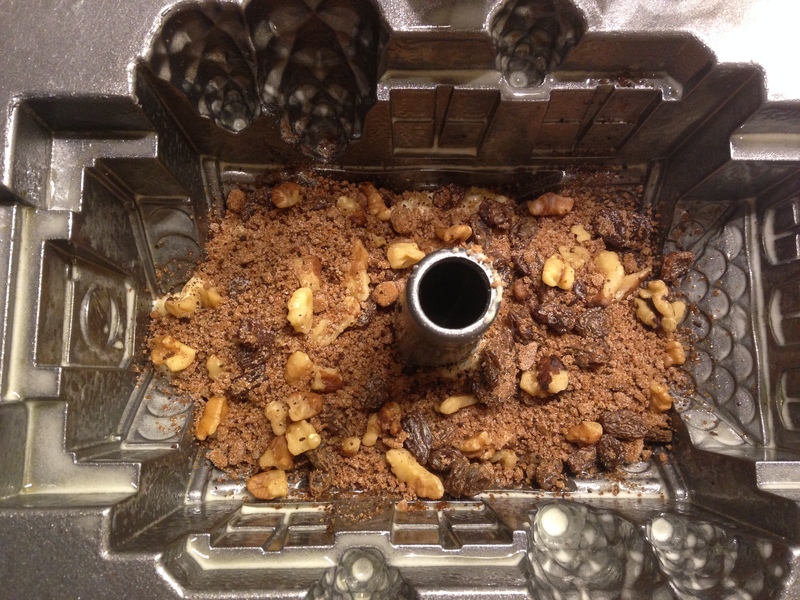 First, mix up the filling – dark brown sugar, granulated sugar, cinnamon, coffee, walnuts, and raisins. Set aside. 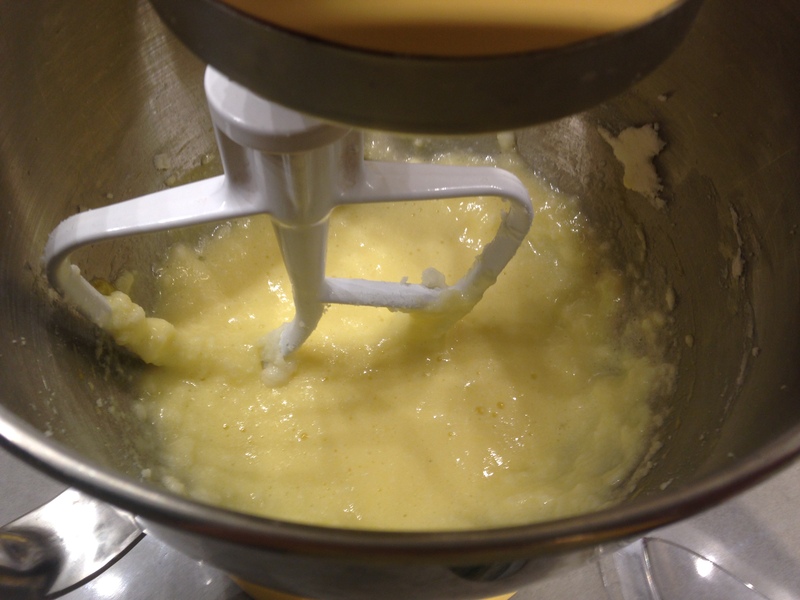 In a stand mixer, beat the sugar and butter on medium speed for 2 minutes with the paddle attachment until creamy. Add the eggs. Beat to combine. Add the vanilla extract, coffee, and sour cream. Again, beat until smooth. Add the flour, baking soda, and baking powder. Beat on low speed until just combined. Scrape down with a rubber spatula. 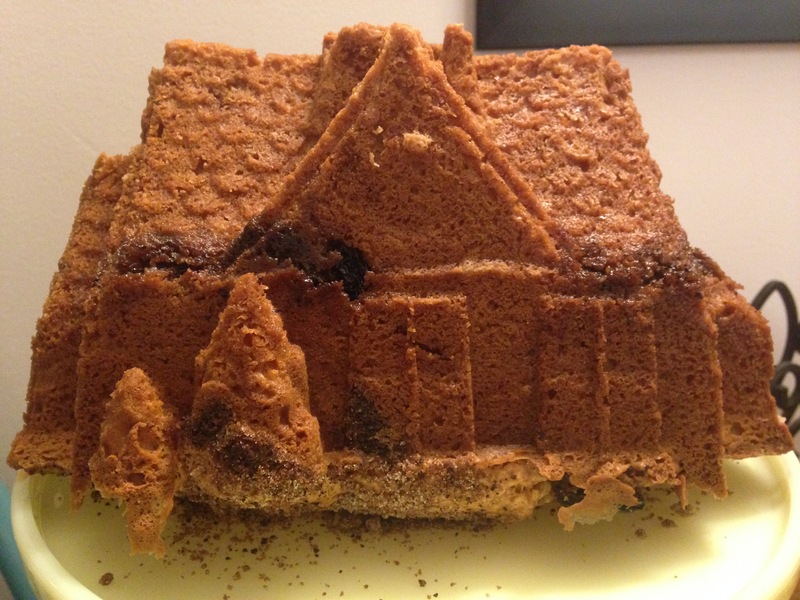 Spray a bundt pan (even if it doesn’t look like a gingerbread house) liberally with cooking spray. 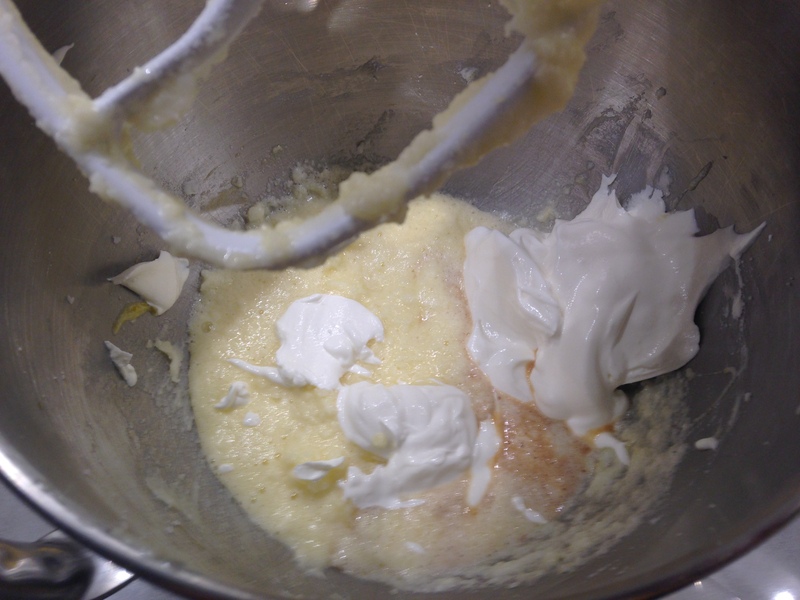 Add half of the batter and spread flat. 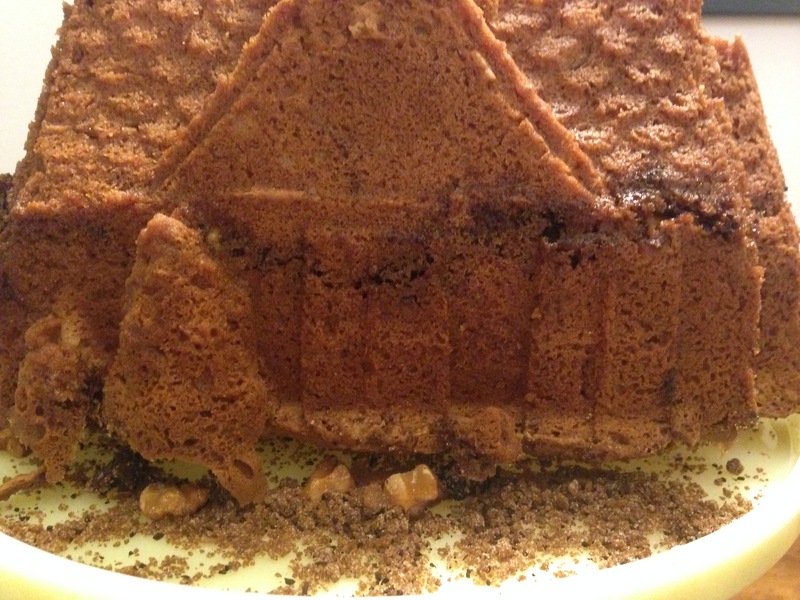 Top with about half of the filling. 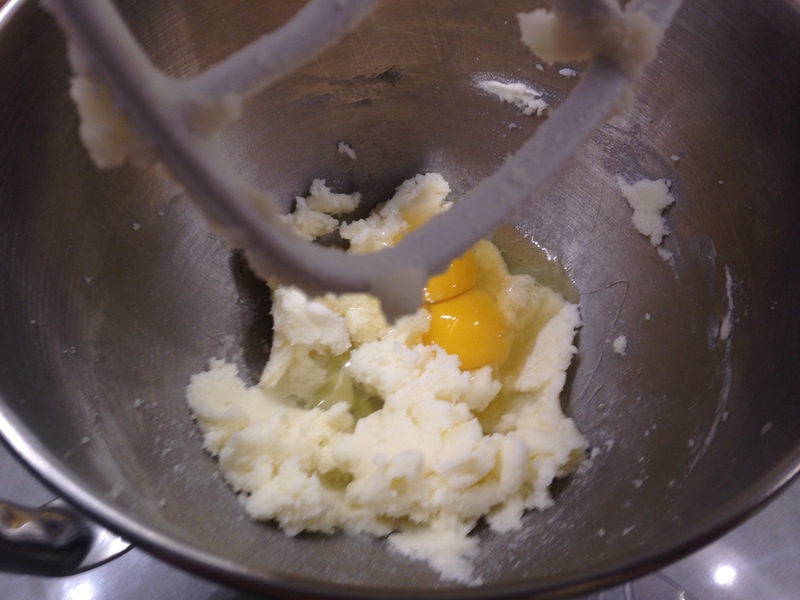 Add the remaining batter and use a spatula to spread up the sides of the pan. Add the rest of the filling evenly on top. Bake at 350°F for 50-55 minutes or until a toothpick comes out of the center clean. 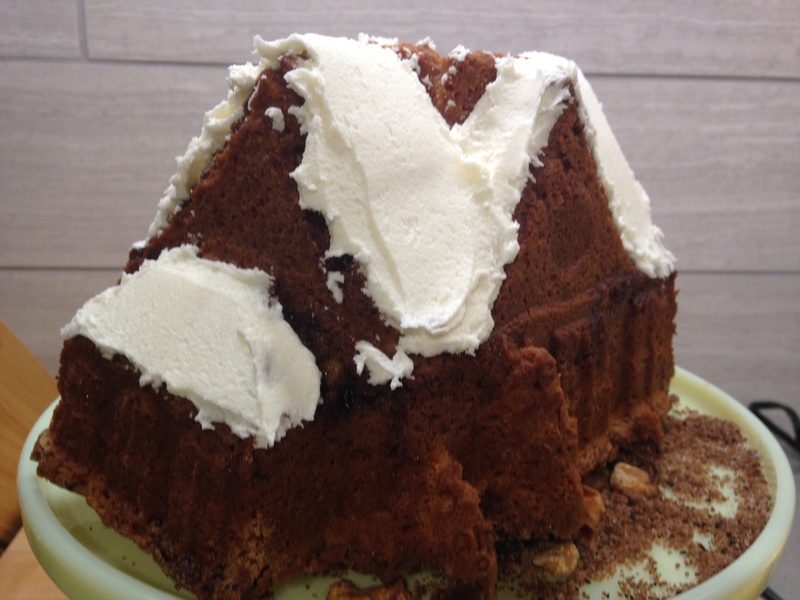 Allow to cool in pan for 5 minutes and turn out onto a plate (or cake pedestal if you’re fancy). 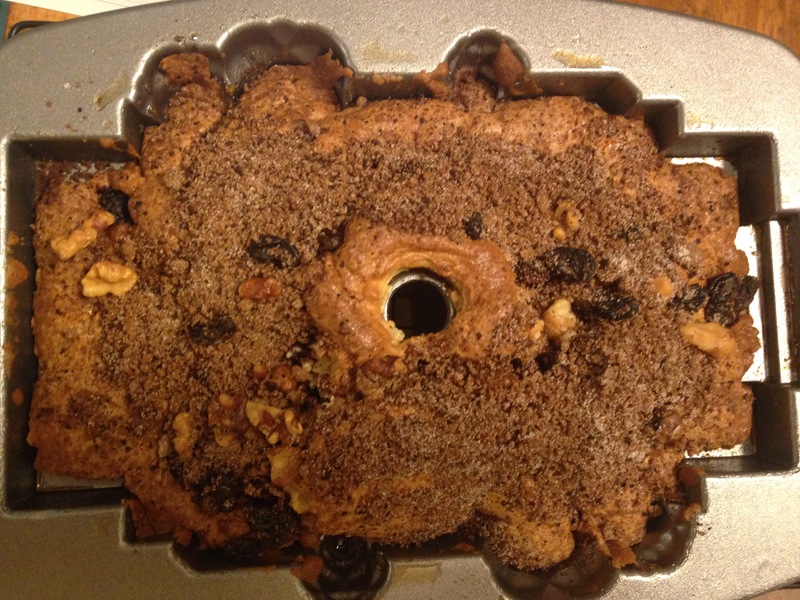 To fully appreciate my bundt pan, it’s important that you see the cake from all sides. At Claire’s, this cake is always served with buttercream frosting. 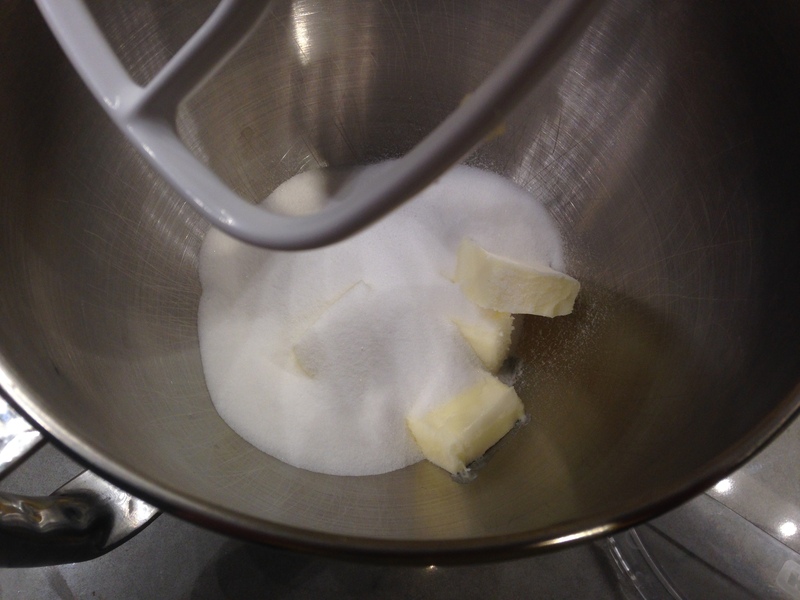 There particular recipe is super easy – literally 1/4 cup butter, 1 cup confectioners’ sugar, and 1/2 teaspoon vanilla. So I didn’t think you needed to see step-by-step. Instead, I give you more pictures of the cake, this time frosted. It’s like it snowed! Just ignore that it’s been 70 degrees in Cambridge for the last week, and it’s basically Christmas. 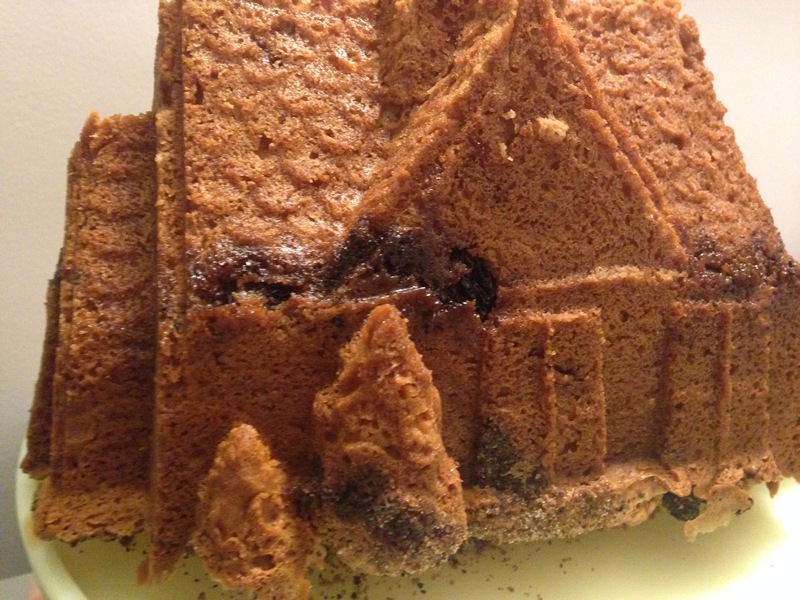 Fun fact about this cake: it’s even better the next day. The frosting solidifies into this delicious texture somewhere between ice cream and frozen yogurt, but not cold. 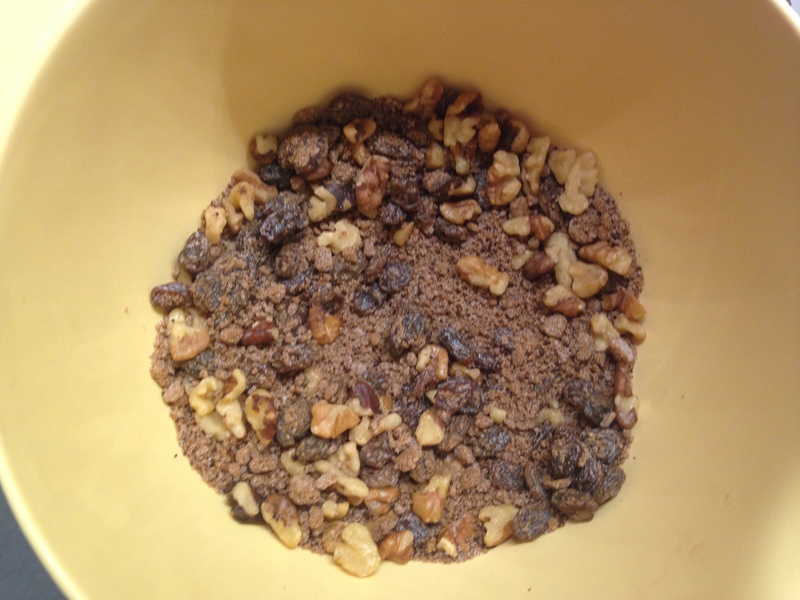 In a small bowl, whisk together the dark brown sugar, sugar, cinnamon, coffee, walnuts, and raisins to make the filling. Set aside. 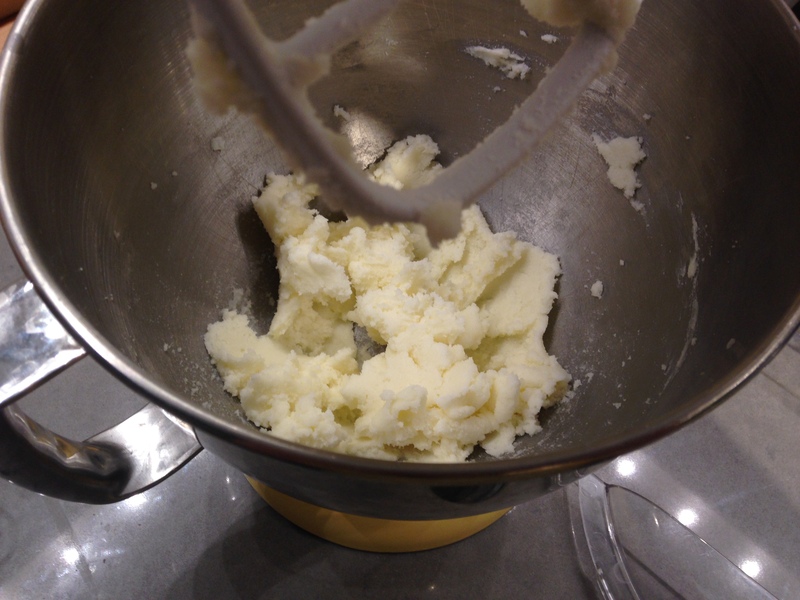 In a stand mixer, cream the butter and sugar on medium speed using the paddle attachment until light and fluffy. Add the eggs, beat to combine. Add the vanilla extract, chilled coffee, and sour cream. Beat until smooth. 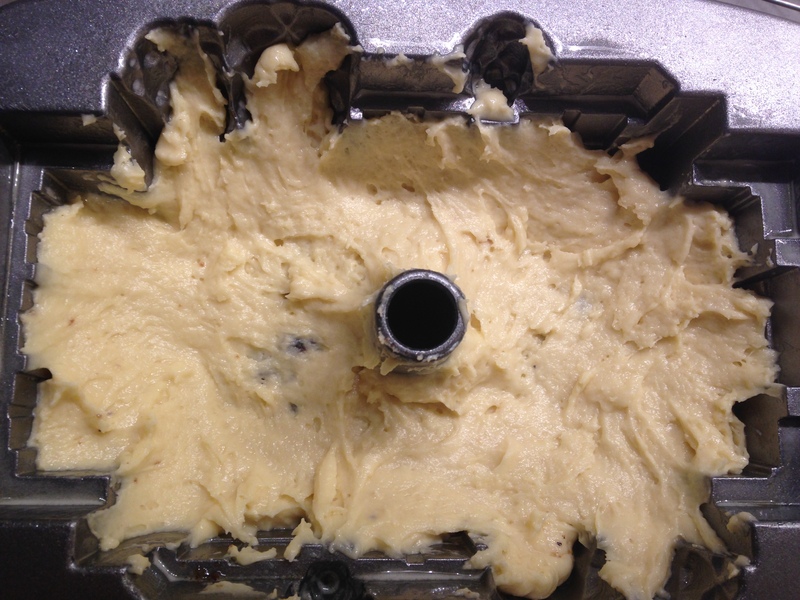 Add the flour, baking soda, and baking powder and beat on low speed until just combined. Spray a bundt pan liberally with cooking spray. 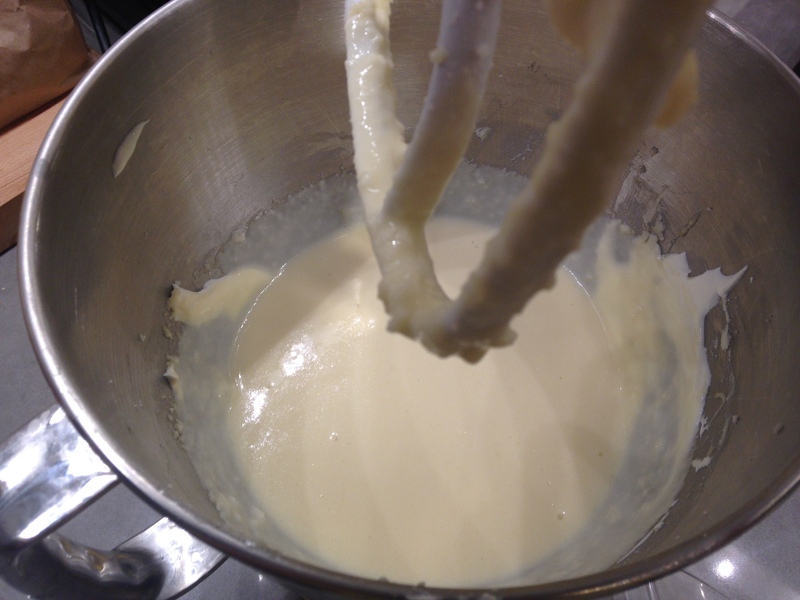 Pour about half of the batter into the pan. 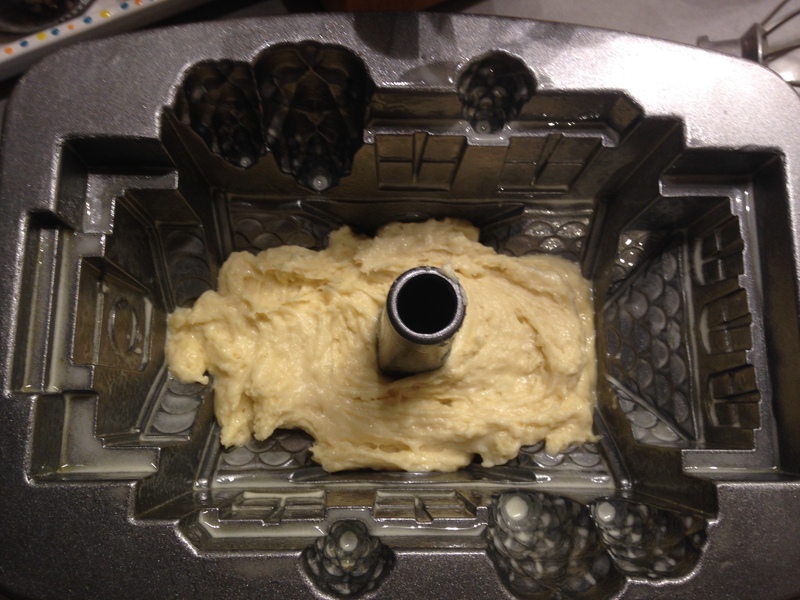 Add half of the filling spread evenly. 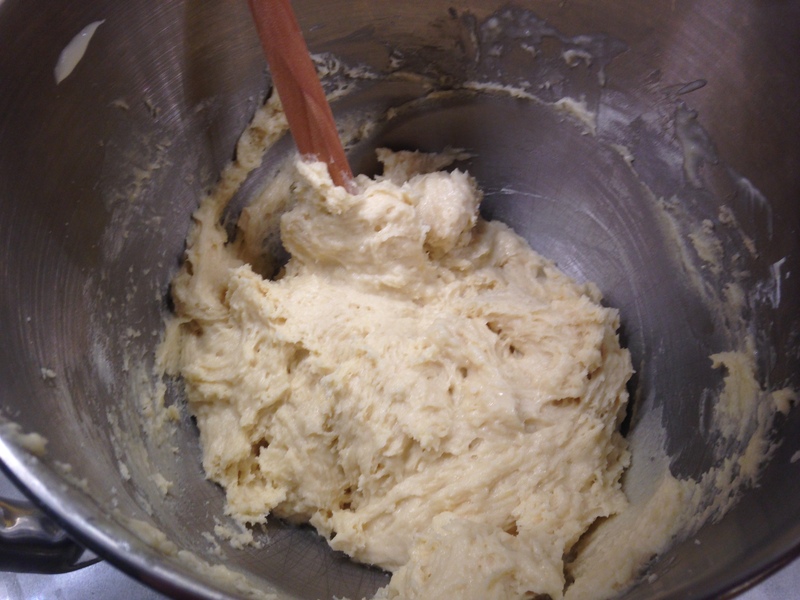 Add the remaining batter and spread up sides of pan. 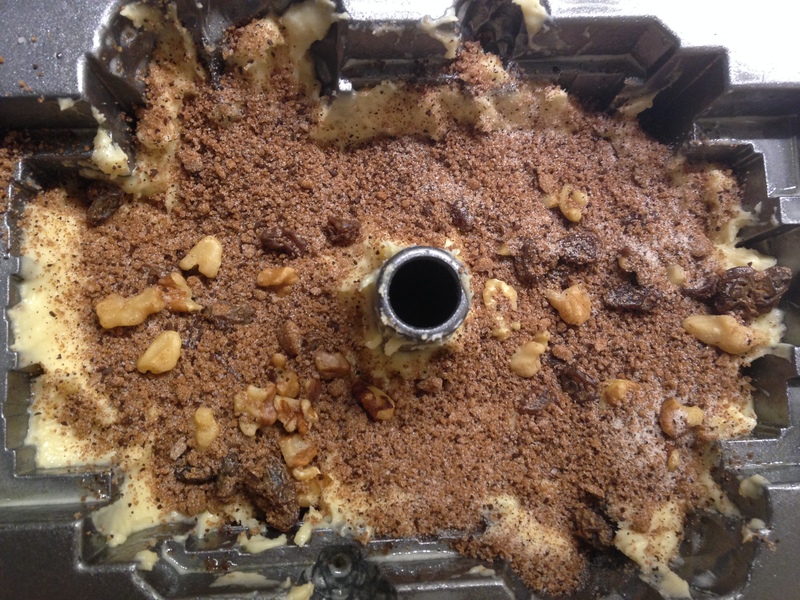 Top with remaining filling. Bake at 350°F for 50-55 minutes or until toothpick comes out clean. Allow to cool 5 minutes in pan before transferring to plate to cool further. Frost as desired.